If anyone is interested in buying this center channel I''m selling the one I own for $100 plus shipping. If anyone is interested drop me an e-mail. God Bless! I try Axiom and Energy as a Center in that Category. This Mission 70C2 beat them by a Mile. For movie, only good word. and for the money...(remember i'm married..)mission 70c2 for the center 702 mains and 701 rears with their 70as sub all for less than 2000 dollars canadian tax in. i think u can't go wrong... conect this to a yamaha 795a and they will rock your world. I have an almost identical setup to the reviewer below paired to a Yamaha 595 and a Toshiba SD3109. If you're up in Canada, A&B Sound carries Mission speakers. They are a great value for the money and blow away most of the competition in their price category. Of course, that is if you like an accurate clean speaker with a great ability to do vocals. If you are getting tired of your 70c2 or are simply ready to upgrade and you live in the U.S., please drop me an e-mail...I'll pay top dollar for yours! I got this for $200, paired up with 701s for front and 700s in the back. This Mission home theatre setup (albeit with 703s up front) was highly acclaimed by a couple British mags, so I went for a listen. Immediately you notice their smoothness and lack of colorations (especially with the smaller, non-resonant cabinets of the bookshelf models). They can tame harsher soundtracks that send PSB or B&W300s screeching. As for this center channel, clear, realistic vocals are what it does best -which is what you'd want from a center channel. A side benefit is that it can really belt out low frequencies down to 60hz, without getting boomy or chesty. this is great for when you run your theater in "large" mode, and keep the sub crossover below 80hz. (Since I tend to be able to localize sounds around 100hz better than most) I'm a believer that the theatre soundfield is just plain better this way. Darth Vader's voice sounds much more menacing, yet convincing/natural. The key competitor to this center speaker that I listened to are the the pardigm cc170/cc350. They also can belt out powerful mid-bass dynamics (ie:explosions) and still handle delicate vocal passages without boominess. Along the same lines, I do not recommend getting one of the mini theater systems (Bose subsat, Energy Take5,poly Rm, definitive pro cinema100, etc) unless space is more important than good sound/value. Most of them make Sean Connery's voice sound whimpy in that Dragon movie. The Definitive's are among the best mini's, but you still can't fight the laws of physics... there is a noticable hole in the midbass. For the same money, you should get a full range, dynamic sound coming from your satellites (studios are now putting bass into the rear channels!) and you just can't get that from a really small speaker. The center channel you pick usually depends on which mains you go with. In my case, however, I was presented with a buying decision where a few different mains were perfectly acceptable to me (KefQ15, B&W302, PSBalpha, even polk RT35), but I did not like their center channels nearly as much as mission's. As with all Missions (and all accurate speakers for that matter), you have to like a somewhat forward sounding midrange. This is where your ear is most sensitive, and thus what will sound overly loud from an *accurate* speaker, relative to a "boom and sizzle" speaker like Bose. The merit of Missions 700 series, I feel, is that for the money, you are getting a very smooth, musical, yet dynamic speaker, something I haven't heard done much better and in a more versatile way until you step up to B&W's 600 series (which are what I tend to see in recording studios here in So.Cal!) -except for the KefQ15, but it has a weak center channel. As always, to each his/her own. There aren't a lot of Mission dealers around, but if you've got one, give a listen to the 700 series. You will certainly not be disappointed for home theatre. As with other reviewers I have gone for the Mission homw theatre set up. I have 702e floor standing speakers with 700 bookshelf rears and the 70c2 centre channel. 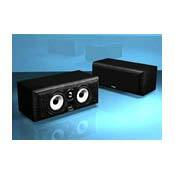 I do not believe that you can get better value home theatre system. It has opened up a whole new movie experience for me, the centre channel is smooth and crystal clear, and I agree with everything that 'Bret' says in his review. It makes mediocre movies like 'The Mummy' a memorable experience. It seems to handle the dynamics of these action movies perfectly without having to keep the volume control in your hand. Clarity, smoothness, realistic representation of vocals. nice tonal balance. I can not state that I can give a comparative review, since I didn't listen to any other centre speakers when I was purchasing. My girlfriend's Dad has a Paradigm centre channel - I much prefer my Mission centre channel. I have 702's in the front and wanted the tonal balance to match and I was quite impressed with my 702's so I wasn't concerned. Of course I listened to them when I purchased and was easily as impressed with the 70c2 as I was with the 702's. I certainly wouldn't purchase without listening. It brings a very realistic representation of vocals and can belt out bass, which is nice, I can localize low frequencies fairly well and do notice a difference. I've heard quite a few different setups and this is the closest it has felt to "being there". I especially noticed in the accident scene in "What Dreams May Come". Since buying the 70c2 I have also purchased 701's and stuck them as the rears and I'm stunned with the performance this setup gives me (including and excluding the costs, which are low). I'd reccommend anyone that looking is looking for low cost musical system with good dynamics that also stuns you in home theatre. I would definately look at Mission 700 series. Clarity, Realistic vocals, Smooth sound, banana terminals. Well, I was in need of a good Center Channel speaker, when my uncle told me about the Mission 70cc2. I never even heard of the brand and I was like well, ok, I will give it a try. Well, I picked it up from the store and hooked it up. When I turned on the receiver I was in awe, because the sound this thing put out was really amazing. It had amazingly smooth sound. The vocals were natural sounding and everything just sounded good. I had a Yamaha RV-905 at the time and it was great, but now that I have a DENON AVR-1801, it sounds even better. I had an old sony center and when I got sick of the sound, I decided to upgrade and look around. I am glad I got this center, cause everything is sounding great. It is a bit bigger than other centers around, but I found room for it.